My relationship with my mother-in-law is tepid at best. I’ve been married to her son for years now and I’ve accepted that we’ll never be close. We’ve had our disagreements, and since my in-laws live out of town we’ve never had the opportunity to work on our relationship. So, we have a sort of polite distance at this point. My husband’s relationship with his mum isn’t much better, so I try not to make it worse by bringing minor annoyances up to him. But, there is one thing that I still struggle with: She has a habit of making rude and ignorant comments every time we see her. It used to be that her insensitive remarks were directed at me, and I could eventually let her thoughtlessness go. But, she recently decided that my daughter was fair game, and now I’m furious with her. I stood there, completely stunned. I recognise there are people, my MIL being one of them, who value being thin over everything else. She’d rather die than be fat. But that’s her own dysfunction and she has no right putting it onto my children. 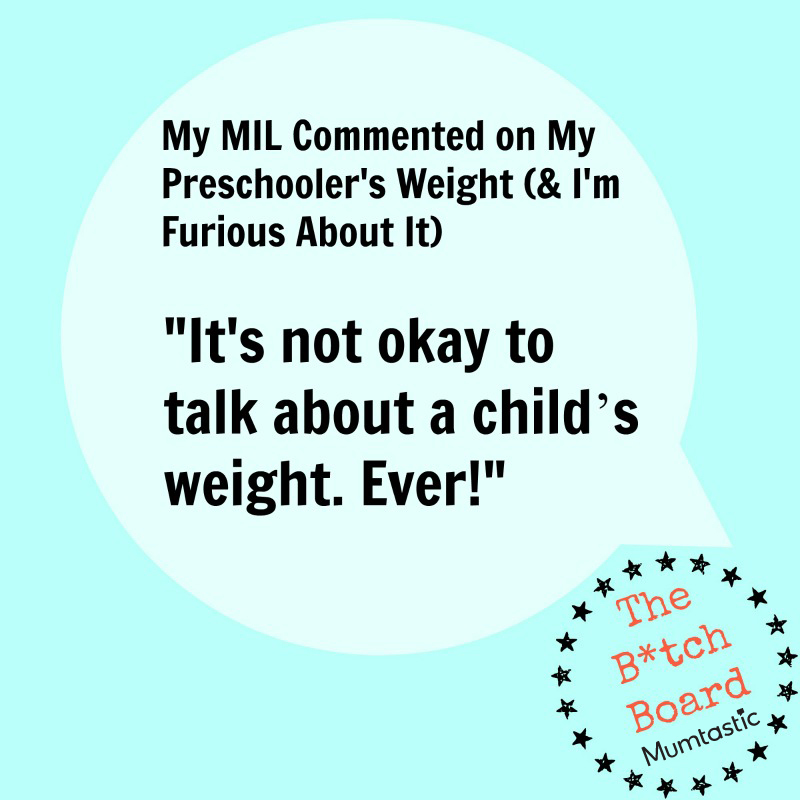 It’s not okay to talk about a child’s weight. Ever! The truth is that my daughter isn’t fat at all. She’s a normal kid with a little bit of adorable chub. She’s healthy, a great eater and a sweet child. Even if she were heavy and needed to lose weight, however, I could never imagine a situation where it would be okay for a grandmother to make comments about her weight to her. It’s just not appropriate. As the mum of both boys and girls, I’ve seen how much more aware little girls are of what other people think of them. In my experience, even the most well-adjusted little girls can equate their own value with how they look, based on feedback from others. When my daughter asked me my favourite colour and I responded, “Purple,” she was heartbroken because I hadn’t selected the colour pink (which she was wearing at the time). 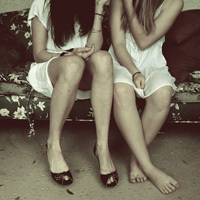 She took it personally, as if I somehow loved her less. I’ve also noticed that she and her preschooler friends want to be complimented on the way they look and can easily be crushed when a special outfit goes unnoticed. As she gets older, my daughter is going to have to learn to define herself by her own opinions and not worry about what others think. But, at 4 years old, I think she should be protected from ignorance and insults. We have a rule in our house that we never talk about other people’s appearances unless we have something nice to say. So even though I make a habit of not commenting on my MIL’s comments, I made an exception this time. When my daughter was out of earshot I calmly told my MIL, “In our family, we don’t talk about the way other people look.” Then I paused and said, “I’d appreciate you respecting that. That is, unless you’d like us to talk about the way you look.” I’m fairly certain she won’t be bringing up my daughter’s weight, or anyone else’s for that matter, again.